Although SEBI has been collecting kudos for getting the Anil Ambani-led, ADAG group to sign the biggest consent order of Rs50 crore in 2011, Moneylife has always held that the regulator, under CB Bhave, allowed the group to get away easily. It did not admit guilt and claimed to have no knowledge about the round-tripping of a massive $250 million into Reliance Communications. Yet, the consent order was conveniently vague and did document the group’s shady transactions through UBS and a host of overseas entities. In fact, the Financial Services Authority (FSA) of the UK shared plenty of information with SEBI on that case and eventually acted more stringently against UBS officials. On 12th August, The Economic Times reported that SEBI is conducting a wide-ranging investigation into the use of funds parked in undisclosed overseas bank accounts allegedly owned by several prominent promoters and CEOs, based on a tip-off from overseas regulators. Apparently, the investigation covers three European banks—two from Switzerland and one from the UK, which, with the help of portfolio managers, have been helping Indian industrialists round-trip money and manipulate share prices. Will SEBI get serious or simply go through the motions of investigation? Also, while the regulator is checking round-tripping, the bigger issue probably ought to be terror funding in the Indian stock markets. Dr SV Raghavan and V Balasubramaniyan, in an article on 12th August, have documented growing evidence of this menace. This was first mentioned by then Intelligence Bureau chief MK Narayanan in 2007, but met with great scepticism. Since then, in 2011, minister of state for finance, Namo Narain Meena told parliament that “10 suspected cases of terror funding in the stock markets have been reported in the previous three fiscal years from 2009-2011.” In November 2012, home minister Sushil Kumar Shinde told an Interpol conference that “credible intelligence suggests terrorist outfits are investing in stock markets through spurious companies, setting up fictitious businesses and laundering money.” The authors say that the Financial Intelligence Unit received several suspicious transaction reports (STR) between 2009 and 2011 that ‘may be linked to terrorist financing’. They further point out that SEBI’s 2011-12 annual report says that it initiated an enquiry against 35 brokers for non-compliance with anti-money laundering (AML) regulations and combating financing of terror (CFT) regimes. Given the seriousness of the issues involved—terror funding, money-laundering and stock manipulation—will the newly-empowered market regulator be under pressure to come up with some answers? Why does the Securities & Exchange Board of India (SEBI) need more powers when it does nothing about the most blatant manipulation? Take the case of Westlife Development of the BL Jatia group, which now holds the lucrative franchise of American fast food giant McDonald’s in south and west India. In July 2013, the Jatias turned Hardcastle Restaurants, into a direct subsidiary of Westlife (earlier called Dhanaprayog Investments) which was a family-owned but listed shell company. But not before the price of Westlife had been ramped from under Rs10 to Rs183. Moneylife first wrote about the ramp up in June 2010. No action from the regulator. In July 2013, we wrote about the continued astronomical rise in Westlife’s stock price and pointed out that it had just 64 shareholders and the price hits the upper circuit with just two to three shares being traded everyday. SEBI officials follow our writing; so it is hard to believe they haven’t noticed Westlife’s vertical price rise. Moneylife also pointed out that the company seemed like a habitual offender and had been pulled up twice earlier for failing to make proper disclosures. We asked why Westlife was not transferred to the illiquid stocks that come under the call auction regulation. Is one big inter-se transfer of shares among promoters per quarter enough to keep the stock outside this regulation? Nothing has changed. In July, we also pointed out that 12 shareholders held 75% of the equity in the company. The remaining 25%, ought to be public shareholding, but four shareholders own 24.17%, according to company disclosures of March 2013—they are Cyprus-based New Leaina Investments Ltd (with a 4.95% stake), Mauritius-based India Discovery Funds (which holds 1.06%) and Rajiv Himatsingka, an NRI, who holds 15.70% and is apparently not a promoter. The remaining 48 persons hold 0.7% of the equity. On most days, one share is traded and it hits the upper circuit. A 1:1 bonus has apparently satisfied the 25% public shareholding norm, making a mockery of that regulation. After this ramp up, on 23rd July, the company sold 54 lakh shares (3.47%) for Rs180 crore to Arisaig, a foreign portfolio investor which means that Westlife is now valued at Rs5,000 crore. This is not the end of the story. The giant McDonald’s, say sources, has mysteriously diluted its 50% shareholding in Hardcastle Restaurants. Has it? While the regulator refuses to investigate, keep reading Moneylife for answers. Something even more strange - It is McDonalds in the US in the business of "food service retail" and it is MacDonalds in India in the business of "quick service restaurants". In addition, the linkage between McDonalds in the US and Macdonalds in India goes cold as far as EDGAR filings for McDonald are concerned in the US. I agree with the author and fellow readers about malpractices like circular trading, insider's trading, non compliance with minimum shareholding norms etc. But the consolidated valuation of the consolidated entity viz westlife + hardcastle would essentially be that of harcastle as it houses the profitable operating entity (MCD franchisee) and it does not matter if it does ONLY MCD as of now. They might add up more .sr businesses in future. If the valuation of hardcacastle is Infact the prevailing price or the price paid by the new investor Arisaig, why is someone doubting the valuation.?? It is OK from a legal standpoint also as the new investor paid the fair value per foreign investment norms. This practice is called reverse merger and is quite prevalent globally not just India where the promoters in unlisted entity buys the public listed shell entity and unlisted entity then merges or is made the subsidiary of the listed valuation. . It is an indirect method of getting listed. Not really sure bout the corporate structure post MCD'S dilution or Arisaig investment though. It's hard to believe that McDonald's corp is not aware of this given these guys are a huge franchisee (all of west and south India). Won't be surprised if McD corp even has a role to play in this structure. Going through the "parent" company (Westlife) website's about page (excerpt and link pasted below) - they don't even say what they do other than run McDonalds.. so why exactly is that a subsidiary?? At the least this calls for a thorough audit of Westlife and ideally some investigation into the practices of the corp globally as well. "WestLife Development Pvt. Ltd. (WDL), a diversified group, is focused on building and developing India’s Quick Service Restaurant (QSR) industry through its subsidiary Hardcastle Restaurants Pvt. 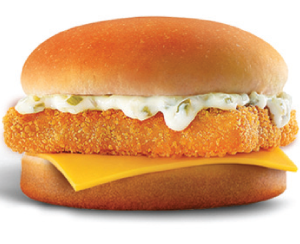 Ltd. (HRPL), which operates McDonald’s restaurant in west and south India. " A clear case of insider trading and a gross violation of the public shareholding norms when one looks at the shareholding and the trading patterns. Hope McDonald's USA takes notice and investigates if it does not want to be seen engaging with an unethical company and take a hit on its brand image which is more important than any franchisee going to this extent to rake in money. It is widely known that in the case of Walmart India, the principals have ensured strict action against anyone found engaged in corruption. Hope this brand too follows suit. Will Mr. Sinha of SEBI please investigate and prevent ignorant investors from falling into this dirty trap? Hope so. What a complete mockery of the rules this is. You can see from the share price increases, to the "trading" to the dilution of stake, that something is very fishy here. Why/How can one of the largest brands in the world allow such sub par corporate governance and non transparent dealing ?!! Who would have thought that one of the largest corporations in the world would come under the scanner for violations as serious as Insider trading, circular trading, price manipulation/rigging and non-compliance with laws in their complete spirit. Did not we recently hear of another big American MNC being investigated by its own government for allegedly corrupt/illegal practices in foreign shores? Is this heading the same route? What also appears to be extremely serious is what the article talks about regarding the MNC diluting its stake in the Indian partnership. At today's market cap, that stake would be worth around US$ 280 million. The MNC is a listed company in the US. It has legal and fiduciary duty to explain what it was paid for this stake sale. Do its shareholders know what has happened? Great work by the author in digging out all this. Strange to read about such happenings. I am sure the truth will surface sooner rather than later. Meanwhile, one waits it with bated breadth. The developments at Westlife are a shocker! !This is a good example of people enriching themself through market manipulation.Obviously,the Regulator(SEBI)has gone to sleep...not surprising since most institutions which are expected to regulate have degenerated.A well researched article. 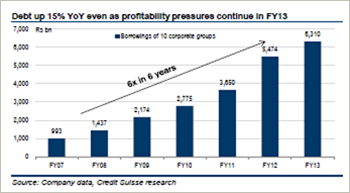 Rising debt levels of top corporate houses, particularly from the Indian infrastructure sector, are expected to put a strain on the Indian financial sector, says Credit Suisse. The worsening economic condition is expected to hit the profitability of the biggest corporate houses hard, such as Reliance Anil Dhirubhai Ambani Group (Reliance ADA), GVK Group, GMR Group and Essar Group, which saw their debt levels soar by 15%, even as economic headwinds and rupee weakness persist. “Corporate asset quality issues are likely to persist and we continue to remain underweight on the Indian banks despite the recent stock price fall and cautious on corporate lenders such as SBI, ICICI Bank, Yes Bank, Union Bank, Punjab National Bank, and Bank of India,” Credit Suisse said in a research note. Credit Suisse have analysed ten top corporate groups namely: Adani Enterprises Group, Essar Group, GMR Group, GVK Group, Jaypee Group, JSW Group, Lanco Group, Reliance ADA Group, Vedanta Group and Videocon Group. The debt levels of these companies have collectively increased by an average of 15%. 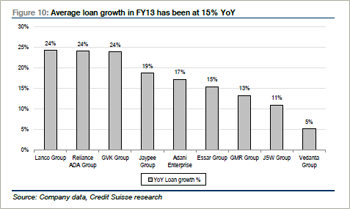 Biggest borrowers Lanco Group, Reliance ADA Group and GVK Group saw their borrowings increase by as much as 24%. Jaypee Group saw their loans increase 19%. “The increasing stress is visible with some loans of Lanco, Jayprakash Associaties and Reliance ADA having already come up for restructuring,” said the report. According to the report, Lanco Infratech have begun talks to restructuring Rs7,500 crore of debt, while Punjab National Bank have restructured Rs3,200 worth of Jayprakash Associates’ loans (part of Jaypee Group). Reliance Power has already restructured some of its debt as it expects its 3,960 megawatt (MW) power plant to commission this fiscal. It is pertinent to note that debt level of some of the companies have even outpaced capital expenditure. This shows that companies are conservative about putting the debt into good use while cash flow continues to be a concern. The infrastructure sector has been badly hit in the last few years as government’s decision paralysis has left many projects stranded, many with high debt outstanding. Nonetheless, it is surprising to note that banks have still issued loans, Credit Suisse said. According to the report, some of the companies have big repayments coming up in 2014, some of them dollar-denominated repayments. 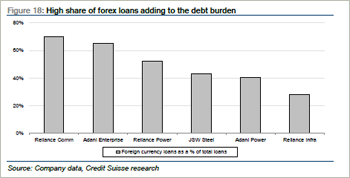 With the rupee under stress, the ability to repay loans in US dollars is likely to be constrained. Many companies have external commercial borrowings (ECBs) maturing in 2014. This includes Essar Oil ($200 million), Essar Steel ($260 million), Reliance Communications ($500 million), Reliance Infrastructure ($250 million) and Vedanta Aluminium ($407 million). However, the debt servicing levels are poor and have been deteriorating. The report states: “With rising debt levels, interest cover for most of the groups has declined further. OH MY GOD! ab kaha jaye hum...!